6 April 2010, at 9:28a.m. 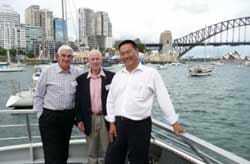 AUSTRALIA - Poultry industry and CRC personnel gathered in Sydney recently to thank one of the industry's most respected statesmen, Jeff Fairbrother, for his invaluable contribution to the poultry industry's development and success over the last 40 years. "Poultry industry and CRC personnel gathered in Sydney recently to thank one of the industry's most respected statesmen, Jeff Fairbrother, for his invaluable contribution to the poultry industry's development and success over the last 40 years. "Dr Fairbrother served as the Poultry CRC's Chair from 2003 until 2010, handing over to The Hon. John Kerin when the CRC embarked on a second term. He was instrumental in getting the industry behind the Poultry CRC in 2002/03, and was appointed a Member of the Order of Australia in 2008 for his services to the poultry industry through research and advisory roles, and the development of regulatory policies on animal health and welfare and food safety standards. "I would like to personally thank Jeff for his tremendous support and mentorship over the years. Without him, the CRC wouldn't have been the success it has and it was evident from the huge show of respect Jeff received from his peers in Sydney that he is held in very high esteem by everyone in the poultry industry. "Further north in Brisbane, the CRC was asked to represent the poultry industry at the National Meat Industry Training Advisory Council's (MINTRAC) annual conference. The CRC's Communication Manager, Chris Day, talked to meat industry delegates about the poultry industry's much admired approach to vocational education and training, which has been driven to fruition by Julie Roberts, our previous Education Coordinator. "Chris said his talk was well received and he looks forward to working with other meat industry members as the new CRC helps open up more opportunities for those working in the poultry industry."